Take a walking tour of New York City and see the historic sites that tell the story of slavery and the Underground Railroad. Travel back in time to the 17th century when New York City was a Dutch colony named New Amsterdam. As you trace the Underground Railroad with your guide, learn about how it freed slaves in the 1800s with the help of key abolitionists such as Frederick Douglass, and discover how slavery played an important role in New York City’s early history and economy. On this guided walking tour, journey back in time and trace the fascinating history of slavery and the Underground Railroad in New York City. Start your tour in Lower Manhattan, where you’ll see the site of Fort Amsterdam -- the first settlement in colonial Manhattan. Visit the former site of the American Cotton Exchange, which housed the offices of two prominent abolitionists who fought against slavery. See the structures the slaves built, such as Collins Wall and Fort Fincastle; hear stories of slaves who were brought over from Africa on merchant ships; and learn about the important role the slaves played in transforming American society. Stop at Wall Street to see the location of the first slave market in New York, and pass a former key location on the Underground Railroad where slaves hid while escaping to free states with the help of the abolitionists. 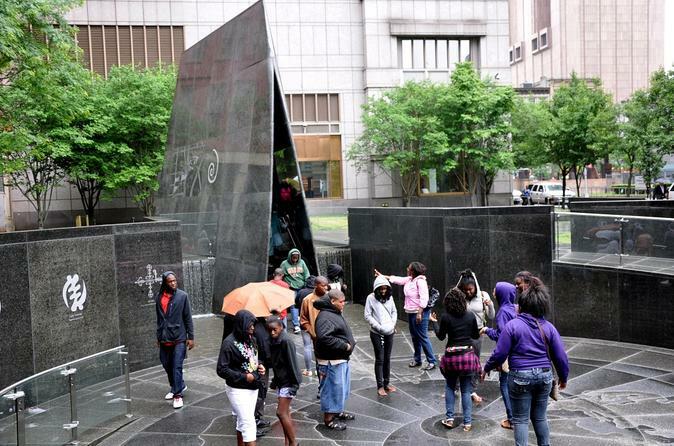 At the African Burial Ground, considered one of the most important archaeological finds of the past century, view various historical artifacts and visit the African Burial Ground Monument. Finally, walk to the former site of the first African-American church in New York, which was also a stop on the Underground Railroad. Nearby, see the still-standing home of one of the most influential anti-slavery activists in New York history, David Ruggles, who provided shelter on the Underground Railroad to abolitionist and former escaped slave Frederick Douglass.